The Andaman Beach Resort on Phi Phi Island is one of our favourites. 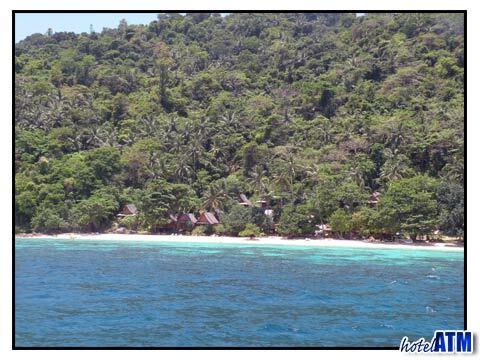 This beachfront resort is very popular with the kind of traveller that is in search of paradise. Overlooking Phi Phi Ley in the Andaman Sea and the Tonsai cliffs of Phi Phi Don you have an unbelievable view, some of the finest scenery in Southeast Asia. The Phi Phi Andaman Beach Resort is ideal budget accommodation for those who need to be down on the beach, have the use of a great swimming pool and at the same time the close to all the happenings of the Phi Phi Don Village. The primary accommodation at the resort are the traditional bungalow or cottages. These bungalows are for two people and have twin and double bed arrangements. The air con Andaman Beach Resort Bungalows on the beachfront have family rooms for three or four as well as connecting rooms and this accommodation surrounds the swimming pool. The Andaman Beach Resort bungalows towards the back of the resort are reserved for the fan accommodation and these rooms are of particularly good value. The deluxe Air-con rooms are housed in the hotel block next to school. The smart new rooms have a beautiful interior decor and modern conveniences up. Up this accomodation is ideal for those who want to to be further away from the centre of the resort and there is a sense of getting away from it all when you walk hear from the beachfront. This resort has a very popular appeal because it hits all the right buttons but importantly it is at the end of the beach. Phi Phi Island Village is a busy island and being at the quiet end means tht you get a feeling of getting away from the crowds. The Andaman Beach Resort tripadvisor reviews and our our reviews give the resort a 2.9 out of 5 which is average for Phi Phi Island. It bill's itself as a 3 star resort but maybe some aspects are nearer 2.5 star. If you bear that in mind and the prices work with your budget, then your stay will be very pleasant. The Harlequin dive school is just next to the entrance of the resort and is open to take PADI dive courses and take customers out to the best dive sites on the island. The professional yet laid back style ensure you get to see the best of Phi Phi Island's reefs without a long trapes in to the village every day.